Dr. Marcy Gabrilowitz knew she wanted to be a dentist since she was eight years old. Working with children always came natural to her and specializing in pediatric dentistry was an easy decision. She is thankful to have achieved this goal as her ambition has always been to brighten the world one smile at a time. Dr. Marcy loves what she does and hopes her enthusiasm and positive outlook on dentistry radiates to her patients. With her calm and comforting manner, she strives to give children the best experience possible with hopes she can inspire her patients to love going to the dentist, and maybe even become one someday! Dr. Marcy is a board certified specialist in pediatric dentistry. She graduated from the University of Connecticut with majors in biology and Italian literary studies. She went on to study dentistry at Tufts University School of Dental Medicine. While at Tufts, she received the Outstanding Senior Award from the American Academy of Orofacial Pain. 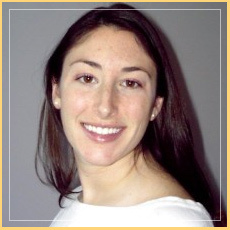 After earning her DMD, Dr. Marcy went on to specialize in pediatric dentistry at Boston University. She received her hospital training at Franciscan Hospital for Children and Boston Medical Center. She currently is credentialed with staff privileges at Franciscan Hospital. In her free time, Dr. Marcy enjoys spending time with her husband, Eugene, and their families. Growing up near the ocean in Rhode Island, Dr. Marcy loves going to the beach, swimming, playing tennis, baking and hiking. Dr. Marcy is an active member of the American Academy of Pediatric Dentistry, the Massachusetts Dental Society, the American Dental Association, and the Massachusetts Academy of Pediatric Dentistry.